Despite having been involved with Magic for as long as I have, one thing I have only seen very rarely is people using this class of card that makes a token copy of any creature. They’re very popular, so it’s clearly just bizarre, random chance on my part. I do remember seeing a friend playing a deck involving Llanowar Mentor, in which he took some extra Tenth Edition Llanowar Elves and wrote the word “Token” over their mana cost with a black marker. When I play Old School formats and use Stangg, I use a Legends Stangg as the original and a Chronicles Stangg as the twin. My preferred solution, which I’ll use once I get around to making a Quasiduplicate deck, is to take an approximately card-sized piece of paper and write the creature’s name and draw a low-quality representation of it underneath. Gameplay-wise, Quasiduplicate is quite similar to Cackling Counterpart from Innistrad. It can be used in many of the same ways, although having to discard a card as part of its “flashback” cost is a notable difference that can be either an advantage or a disadvantage. A tempo or midrange deck won’t always have cards that it can afford to just throw away in a close matchup, but there are other times when you’d love to exchange an excess land for another Ravenous Chupacabra. It’s also surprisingly easy to use in spellslinger decks, especially for larger formats, where you get a lot of advantage when you discard anything with flashback or madness, not to mention the likes of Spellheart Chimera. Quasiduplicate is an awful lot like Innistrad‘s Cackling Counterpart: same mana cost, the same restriction of only being able to copy your creature, and even the ability to cast it for a second time. The original was an instant with a higher flashback cost (7 mana! ), while Quasiduplicate is cheaper (3 + discard a card) but also is a sorcery. Win some, lose some. 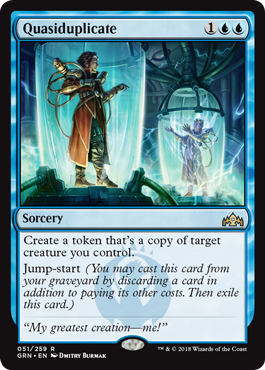 Quasiduplicate is as powerful as the creatures in your deck; while Izzet sometimes has trouble with having good creatures, Dimir (which this can be flexed into) more than offers that. Copying, say, Doom Whisperer or Dream Eater offers a very large swing, and being able to copy them twice for a modest price is also reasonable. The challenge is to find a blue deck with enough creatures where this is at home; I trust such a deck can exist, but blue having the weakest creatures on average means that there might be a bit of growing pains that way.